Greeley and parts of Thornton, Brighton, and Longmont are in Weld county. Colorado Choice will be called Friday Health in 2018. Anthem BCBS has 361 unique providers in Weld County. Anthem BCBS has 29 unique facilities in Weld County. Anthem BCBS has 390 total unique providers + facilities in Weld County. Bright has 24 unique providers in Weld County. Bright has 3 unique facilities in Weld County. Bright has 27 total unique providers + facilities in Weld County. Cigna has 0 unique providers in Weld County. Cigna has 36 unique facilities in Weld County. Cigna has 36 total unique providers + facilities in Weld County. Colorado Choice has 300 unique providers in Weld County. Colorado Choice has 26 unique facilities in Weld County. Colorado Choice has 326 total unique providers + facilities in Weld County. 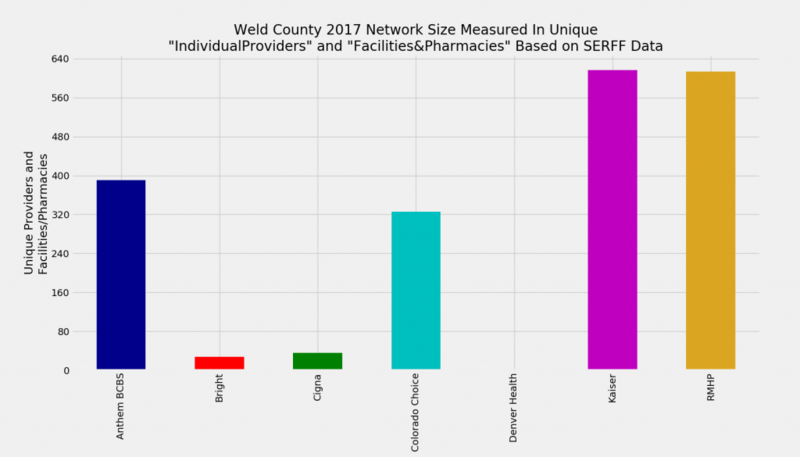 Denver Health has 0 unique providers in Weld County. Denver Health has 1 unique facilities in Weld County. Denver Health has 1 total unique providers + facilities in Weld County. Kaiser has 590 unique providers in Weld County. Kaiser has 27 unique facilities in Weld County. Kaiser has 617 total unique providers + facilities in Weld County. RMHP has 541 unique providers in Weld County. RMHP has 72 unique facilities in Weld County. RMHP has 613 total unique providers + facilities in Weld County.